You can follow our passages and our trip using this near realtime SPOT map. When we are out of Internet connection, or when we are moving the boat, we place a pin location onto this map. To see our trip, drop down the HISTORY button and select as many days or weeks or ALL and then click GO. Then zoom the map out to see the trip. We are planning to make some ocean runs this year on our run from the Bahamas to Rock Hall, MD. Our current plan, launching Thursday, 0700 April 24, 2014 will take us from Green Turtle Cay to Fort Pierce Florida where we will anchor by Friday 1900. There we will stage up for a run from Fort Pierce Florida to Charleston South Carolina, a 400 nm leg. We plan to spend a few days there taking in the great town of Charleston and then we will make a 200 mile jump to Beaufort North Carolina where our great friends Greg and Kate will NOT BE :-(. From there we will run north into the ICW and up to Norfolk to our free dock at Portsmouth and then into the Chesapeake Bay. So, Our Bahamas 2014 trip is drawing to a close with one last party at Green Turtle Club with our boat buddies as we enjoy the music of THE GULLY ROOSTERS. They start playing at 9 pm, “cruisers midnight” but we will dinghy in and enjoy the music. In the AM, we will derig the dinghies, taking off the motors, and fuel tanks and anchors and lashing them into the davits for the gulf stream crossing. Lucky for us, the winds and seas are calm, and the passage will be a casual motor run. The weather fronts are not giving us the best sailing winds, so, we are taking this calm to run to the coast and stage up there for the next front to sail north in the Gulf Stream. Who knows, if our weather router, Chris Parkes says tomorrow night that it looks for for a go to Charleston, then we may just hang a right and keep going norht. WHO knows???? 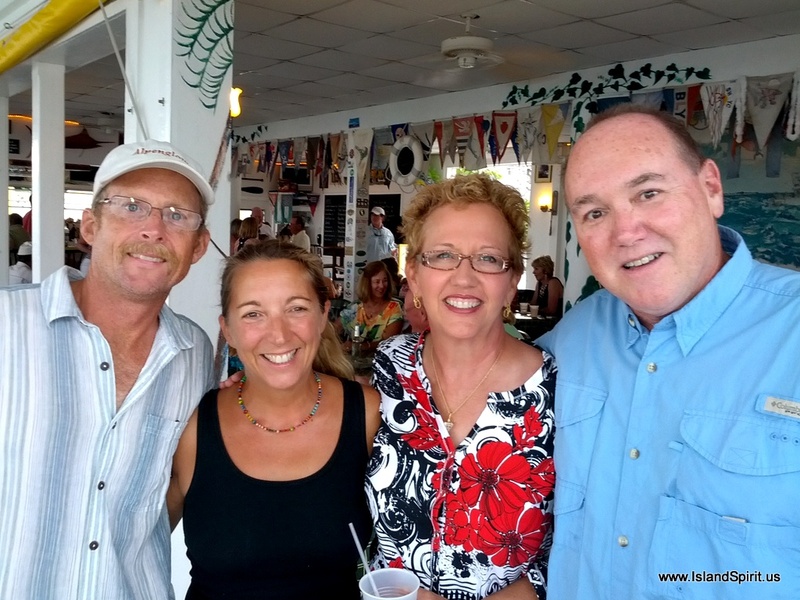 Stephen and Jason, the best Bartenders in Abaco….. Here we are spending a week based out of Marsh Harbor anchored right off our favorite place, THE JIB ROOM. We have completed our boat services preparing for our exit north and run back to the US coast. We have been studying the weather every day at 0630-0730 with Chris Parker on SSB 4045 mHz. Then we look at NOAA weather, trying to keep up with the frontal progressions, watching for an exit window for our crossing. Meanwhile, life around here is really fun and easy. With Wednesday night RIB NIGHT, Saturday night STEAK NIGHT and toss in Thursday night with Cruisers POT LUCK, the Jib Room has it figured out. Great people, great atmosphere, great family, great food, great drinks, great friends, The Jib Room is one of the reasons why we are here! Thank you Tom, Linda, Stephen, Bradley, Jason, Desmond, Marvin, Latasha and the rest of the staff. What a fantastic team! From Marsh Harbor, we motored over to Man O War Cay, anchoring off the island and taking the dinghy into town for a review of the shops and great businesses. It was fun to show our boat buddies, Dixie and Julie, the Albury Brothers Boat Building business, Albury Sail Loft, and Edwin’s Boat Yard. Of course a stop at the ice cream parlor was a must and a walk to the ocean beach observing the beautifully kept homes and gardens of Man O War. The residents of Man O War are very industrious and hard working. What a great island. Finally, no trip to Abaco would be complete without a trip to NIPPERS, especially on Easter Sunday. This year we traveled by Albury Ferry due to northhwesterly winds. The famous Nipper’s Easter Egg Hunt on the beach and in the surf on Great Guana Cay is fantastic. Johnny has been doing the Sunday Pig Roast Buffet for 20 years and it is very well attended. Toss in the delicious NIPPER JUICE, and a beautiful beach, a gorgeous pool, great music, dancing and swimming and you will see the fun of Nipper’s. Thank you, Johnny, for hosting a really great Easter Day! Hayden is holding 6 crumpled fishing boat stickers he peeled off The NIPPER’s sign! This idea of fishing boats slapping their stickers all over public spaces is really frustrating. We see it as vandalism. We peel off every one we can. Hayden would love to find one of these fishing boats and put 1,000 stickers on its hull. Easter Egg Hunt at Nipper’s on the beach. Some eggs were hidden in the seaweed. Radeen and Hayden, appreciating the sun after a windy, rainy Saturday. Hayden with THE MAN, JOHNNY, owner of Nipper’s Beach Bar. Thank you, Johnny! So, our time is drawing to a close here in Abaco. We are looking at moving north of the Whale Cay Cut on Tuesday, heading up to Green Turtle Cay. There we will make a final study of the fronts and weather patterns and set our exit for the coast. We are looking at making a run from Great Sale Cay to anywhere in north Florida or South Carolina. We are thinking of trying a 2-3-4 day ocean passage with a few other boats, but it will all depend on if we can find a good weather window. Wind and waves shape the sands on Tahiti Beach…. Cruising the Abacos is so wonderful and so easy. Most anchorages and popular destinations are 8-10 miles apart. The Sea of Abaco is protected and almost always calm as it is only about 3-4 miles wide and maybe 20 miles long. With the much of the orientation of the sea north and south and the trade winds blowing from the east, we can beam reach nearly everywhere. Many times, we are lazy and simply roll out a jib and sail the 8 miles under jib only. There are so many places to anchor and find protection, it is easy to see why so many cruisers make Abaco their only destination. Stupid us! It was windy and we ran the inflatable dinghy into a sharp propeller that was tilted out of the water! This is the 4 inch cut with glue applied and drying. It went through the rub rail, too. up for repairs, before it sank! The final repair and finished patch. Great to know how to glue on a patch and to have all the necessary supplies! We are now living on the hook in Marsh Harbour, walking the town and visiting with boat buddies. We are beginning to look at weather windows over the next two weeks to make an ocean run for the USA coast. Time is running out here in the Bahamas for our 2014 trip. Soon we will return to the land of connectivity, marketing, shopping, and conveniences…. Photos show the first few days of our Hope Town, Bahamas Vacation. (Wait, we are always on vacation, but this really does feel like a vacation.) We love it here! When you look at these photos, you will see why…. Living on a boat in Hope Town Harbor on a secure mooring ball can really spoil a boater. There are many cruisers who make this their winter home and I can see why. The town is a dream, the facilities are beautiful, the lighthouse is a world treasure and the mooring balls are secure. Hope Town, Bahamas, add this charming village to your must visit locations…..
We sailed a dream sail with beam winds 20-25 50 nm from Royal Island near Spanish Wells up to Little Harbor on Abaco. Here is a GoPro video, 2 minutes that I shot to show the scene. Sail on…. Here are some photos of this great sailing day. Look MOM, no staysail boom, it is not needed. Stopping in at Spanish Wells the last few days of March is a special reward as the Lobster season closes on the 31st and the entire fishing fleet returns to port. The boats are spectacular and the excitement of the town is electric. Everyone is so proud of their fishing fleet and the teams who jointly own and operate these lobster harvesting rigs. The fleet stays out on the Bahama Banks for 3-4 months to work their “Lobster Hotels,” diving for lobster 10 hours a day. The large ship anchors nearby while the 4-6 chase boats run with two men each. The chase boat has a driver and a scuba diver on a hookah rig. Between stops, the diver never gets back into the boat but rather kneels on a small platform next to the outboard while the driver rapidly moves to their GPS points for the next lobster hotel dive. The diver drops down quickly to the lobster hotel which is a 4′ x 8′ corrugated steel sheet on legs. He rests one side of the hotel on his shoulder and, using a steel hook, pulls out the largest lobsters, leaving the egg bearing females. The diver returns to the surface with 10 or more lobsters, holding them by their antennae. and tosses them into the stern of the boat. The diver then kneels on the platform and the driver jets off to the next hotel. This is very hard work, from sun up to sun down. The lobsters are cleaned and the tails are immediately flash frozen and stored in the bilge freezer. Three to four months later, the ship returns with thousands of pounds of frozen lobster tails. Welcome to Spanish Wells, a proud, hard working, close knit community like no other in the Bahamas. This was our first visit here and we will make sure we always stop here, especially the end of March to see the fleet return. If I were renting a Spanish Wells cottage, this is STILL #1 on the island! Conch horn at sunset. Thank you CAREY, for my conch horn! Radeen and I would both have to say, that Spanish Wells is a mandatory location and could spend a full week or more here. We have only started to discover the many aspects of this great town and the friendly people. One example of friendliness was the young mother at the grocery store who sent Radeen and Julie to her yard to pick fresh basil. Add in a ferry trip across the Devil’s Backbone to Harbor Island and we have much to explore and learn. We will be sure to return to Spanish Wells! This was one of our best sailing days in the Bahamas this year. We sailed from Rock Sound Eleuthera to Current Cut, then ran the cut and turned the corner to drop the anchor off Current Settlement Beach. This was a 52 mile day, we started at 0730 and ran the cut at 1530 and dropped anchor around 1600. Sailing the Bahamas in calm seas and 20-25 knots is a joy.